Hollow is a difficult game to play. We don't mean that in the sense that it requires great skill to complete, or that its dark sci-fi horror world is especially harrowing. Those would both be valid, even praiseworthy qualities. No, Hollow is difficult to play in mostly all the wrong ways. 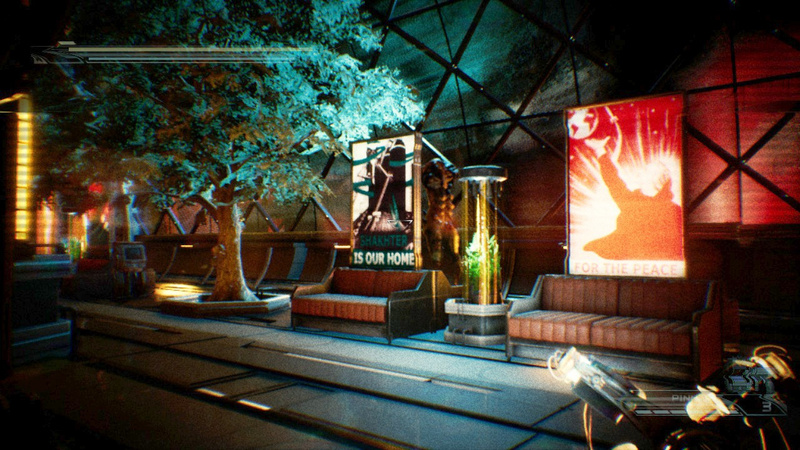 The game is perhaps best described as a first person survival horror experience set on an ostensibly abandoned space mining vessel. 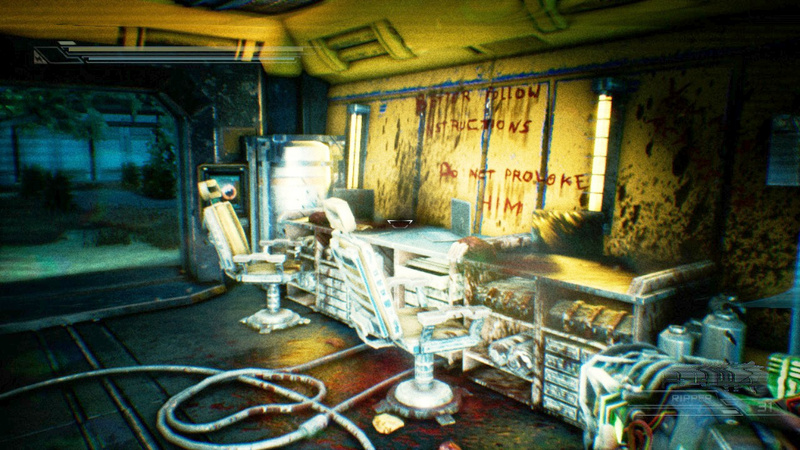 Of course, it's not abandoned at all, and it should come as no great spoiler to reveal that that you'll soon encounter a species of hellish creatures that specialise in gruesome body horror. 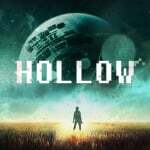 The first thing to note here is that Hollow is as ugly as sin, to the point where its murky, low-res, jerky visuals make it an active challenge to see where you're supposed to be going. It can be very difficult distinguishing between background elements and key points of interaction. At first we wondered if it was just that some kind of heavy digital distortion filter had been been layered over to give the claustrophobic impression of wearing a space suit. Perhaps such an effect has been employed, but the effect of this - combined with the aforementioned murk and jerk of the graphics engine - is to seriously hamper the game's playability. If you're like us, it might even give you a headache or make you feel a bit queasy. It doesn't help that the Shakhter-One - the mining vessel your potty-mouthed protagonist wakes up on - is such a bland environment filled with repetitive corridors. There's a map overlay system that automatically orients itself according to the player, but it's both cool and useless in roughly equal measure. Another thing that doesn't help with Hollow's playability is its excruciatingly lethargic movement controls. 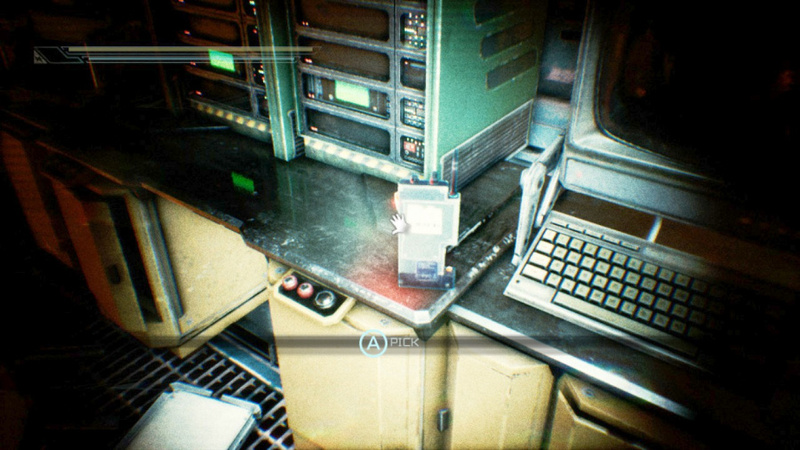 Like the visual murk, we actually found ourselves making excuses for the game, wondering whether maybe this was intended as a means to reflect the protagonist's discombobulated state. But no, you really do just move and turn like a sloth on valium. Incredibly, there appear to be three levels of speed available to you, but even the top one doesn't seem to get beyond a leisurely shuffle. Aiming your firearm is similarly sluggish and lacking in the tactile feel that even half-decent console FPS games possess. Indeed, combat with the game's spindly-limbed enemies is generally turgid. It seems to be a lottery as to how many of your brutally limited shots will put a creature down for good, while being left without any ammo and only your weedy kick is just about the most miserable situation you can find yourself in. Good like finding spare ammo in those blurry environments. This might all have been redeemable if Hollow told a good story, but unfortunately it doesn't. The incidental text and subtitles are saturated with the kind of typos and odd word selections that tell you the developer isn't a native English speaker. That's no crime of course, but why a proper translation effort wasn't undertaken - especially when an American-English voice cast has been brought in to perform the script - is mystifying. We won't go into the game's borderline obsession with the naked female form, other than to say that this is a 'Mature' game in the loosest sense of the word. All in all, playing Hollow is a bit of an ordeal, and not one of the emotional 'my goodness this is tense' variety. You'll perhaps need to turn to Resident Evil Revelations if you're after that kind of thing on Switch. Looking at Hollow's history, it seems to have started out life on Steam for PC, which offers a few potential clues as to some of its issues. Giving the developer the benefit of the doubt (again), there's every chance that this isn't a flat out bad game. Perhaps it's just a bad conversion. Either way, Hollow for Switch is a scrappy, sluggish, technically questionable experience that we can't honestly recommend to anyone. Hollow is an incredibly ugly game with the kind of plentiful technical issues that make it actively difficult to play. Those with a masochistic streak might derive some pleasure from its abrasiveness and its downbeat tone, but most Switch-owning horror fans would be much better served playing through Resident Evil Revelations and its sequel for the umpteenth time. Damn it. I was really hoping that this game would be great. When the Game first appeared on the eShop it looked quite promising. Man, they were angry at me for giving it 3.5. How pissed will they be with a huge site like Nintendo Life giving it even lower. @Paperboy User reviews and Metacritic? @Paperboy Definitely. Every user review is the first review on their account, besides 2 people. And those 2 people happen to have 9.9 or 9.4 average rating. Considering every review is good, something is up. I had a feeling this would be a stinker. Glad I held off. See ya! One game off wish list, 25 to go. what a shame and now glad I didn't bother getting this one was tempted as I could get it discounted but not getting on the basis of that review it sounds terrible! @Paperboy @BezBot Wow! Those user reviews are incredible! What FE need to do now is get all their development team to post really high reviews for their game and it will become Metacritics GotY 2018! I totally grabbed this one cause it was discounted lol, I was on the fence but I figured I'd take a stab at it for $14. I will say this...I'm sort of enjoying it and trying to appreciate it for what it is, but it doesn't make it easy lol. I had some doubts that this was going to turn out to be the kind of game many hoped it would be but after watching @Jordan_SW great review, it turned out to be something even worse than I'd feared. A total and absolute stinker! This reviews confirms it further. Luckily for Hollow, we just got Superola and the Lost Burgers or this would be down there with Vroom in the Night Sky, scrapping for the honour of being the Switch's worst of the worst. Yowch! I was interested in this but decided to wait on reviews, glad I did. The timing of this release couldn't be worse considering that DOOM has just been updated with motion controls and other improvements, breathing new life into an already excellent experience. I may still consider Hollow at a heavy discount, but DOOM is demanding another play-through first (perhaps now at a higher difficulty). "It seems to be a lottery as to how many of your brutally limited shots will put a creature down for good, while being left without any ammo and only your weedy kick is just about the most miserable situation you can find yourself in. " @Paperboy Wow, you are not wrong! Very suspect. @nhSnork I might be in the minority, but I actually kinda dig whatever is going on graphically. Maybe I'm just an arty dork, but i think the filters or whatever it is makes it look rad. I think the big thing that is being missed here is this: I don;t think this is intended to be a true FPS, or maybe even a full throttle action game. I don't think any dev. in their right mind would make the movement speed that slow, or make so many deliberate artistic decisions unless it was at least SOMEWHAT intended. I think they might have fallen a little flat in some areas, but i think they intended this to be a "slow descent into madness" kinda thing, and it really does convey that. Could it be better? Most certainly, but I think if you take it as what was intended then I think it's not as bad as it's being made to sound. Not saying it's a modern classic or anything, but so far besides some annoyances I'm actually enjoying it. I figured this would be bad when I watched the trailer, the Steam reviews backed that up. Ha ha. My favorite part of the review was the complaint of typos in the game. It’s my favorite because it’s mentioned directly after a typo in the review itself. I think that’s called irony. ‘Good like’ finding it. Ouchh!! 3 out of 10? Harsh but if the game deserves it then ok I guess. Edit: Thanks for the review btw. The title pretty much sums up the game! Well at least Outlast came out of nowhere on the eShop, good game but very expensive. Complete disagree to this review. Ugly? Cmon! I remember when the Switch first came out and I was buying every game that was released on the Eshop and most of them were pretty good. Lately it seems like there’s a lot of trash on there. @MisterMan It was inevitable. Whatever goes up must come down at some point. Is there a reason games like this get so poorly made and optimised? No really I’m serious I’m no developer, but it seems so odd to me that a game in 2018 is buggy as hell and looks like crap? With all the tech we have and the fact these devs MUST have played this before releasing boggles my mind! The trash on eshop is growing rapidly. Whelp, Hollow is thy name, so off my wishlist you go! But...but...the screenshots look far from ugly! nooo, I was so looking forward to this. It's not an excellent game but I appreciate its ambiance. Its slow pace doesn't put me off. It's not worth its price right now but maybe on a sale. Pity, there needs to be more games that have a "borderline obsession with the naked female form"...but actually have them be good. Well, I was looking forward to this, and got it day one. I for one kinda like the looks of the game. Heck, I like the game, but it has a lot of issues as well. Then there's the enemies themselves. Great design, but very, very little variation. Combined with the nudes hanging on walls, it's disturbing in the wrong way. It looks as if the weapons pack a punch when you see limbs flying, but the bodies disappear in no time, so that effect is kind of lost, sadly. That brings me to the weapons: they are fine, but melee should at least have more,well, kick to it, and the weapon HUD should be a lot easier to see. At least then, the player knows when to reload. Important, when you lose any ammo left in the current clip, and there's this little to be found. So glad I paid full-price for it 🙄 and what’s worse is its already reduced in the Easter sale, along with everything else I’ve bought in the last two months - there’s a valuable lesson here: don’t buy eShop titles full price! I just noticed that this is now around £3.60 on the Norwegian eShop. Gotta be worth a bash for that, surely ? Is anyone else having problems with saving? After the 1st save station, the next ones do not work! And everytime I die it takes me back to the 1st computer! Help? Purchased today as it's 89 pence! Well, actually zero pence as I had coin credit thingies.